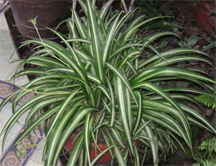 A spider plant, chlorophytum comosum. To potted plants, resources consist of air, water, and whatever soil is contained in their pots. As the plant grows, it gradually converts resources to plant tissue, filling the pot with roots. In effect, a potbound plant is a plant that is trying to operate with too few resources. When a spider plant becomes potbound it tends to produce plantlets, which are its way of searching for more resources. In this way it devotes some of its few remaining resources to closing the gap between the resources it has and the resources it needs. A similar thing happens to the people of an under-resourced organization. They, too, try to close the resource gap. They do this by reducing their workload, and by scrounging resources. Since the organization determines both workload and resources, these actions by employees are contrary to internal policy. They are usually carried out in a manner designed to escape internal controls. An organization that chronically operates at insufficient resource levels might be compelling its employees to circumvent its control processes. Photo courtesy Wikimedia. Do you remember what life was like when workloads were more human-scale? When two one-hour meetings in one day was an unusual load? When one department worked on one project until it was complete, and only then would they start another? We all have too much to do these days. Some of us have no other experience of work. Others have forgotten what "enough to do" was like. Here are some reminders, expressed as what life would be like if we all one day had enough to do — and not more. When you get a great idea about something that isn't extremely urgent, you have time to make a note of it before you forget it. When you get a great idea, you sometimes set aside whatever you're doing to think about the great idea. Is it really a great idea? What are its implications? At quitting time, you actually go home for the day. When you go home for the day, you don't feel guilty. When you arrive at home, you don't have the urge to snap at the first person you meet there (especially important for those who live alone). Weekends last two entire days. Vacation days don't accumulate because you actually use them. You never lose vacation days due to expiration. You no longer worry about burnout for yourself or the people you supervise. When something unexpected happens in one project, it's much easier to reschedule others to accommodate it. You spend so much time at home that your kids seem to grow up more gradually. You eat a lot less take-out. It's been a long time since you had to reschedule a medical or dental appointment, or jury duty. Sometimes entire days go by without your having forgotten to do anything important. Once in a while, you actually complete an item on your to-do list without interruption. Some days — not many, but enough — your to-do list actually gets shorter. You rarely fail to return the phone calls you want to return. Most of the time you get through one day's incoming messages, mail, and email before the next day starts. to do anything importantrecently read a book. For fun. You have much less need to multitask, which is good, because multitasking never really worked as well as you thought it did. You've re-learned how to monotask almost as well as you could when you were four years old. For some time now, you haven't felt that nagging urge to get better at time management. You have space for serendipity — when a rare opportunity comes along, you have time to take advantage of it. Would you like to see your comments posted here? rbrenjwGaiVHyULFzskAUner@ChacVaIejFwjHyAjZAfQoCanyon.comSend me your comments by email, or by Web form. I offer email and telephone coaching at both corporate and individual rates. Contact Rick for details at rbrenaanYsGIsPcdtEYjHner@ChacubvccdnYjqCefQuRoCanyon.com or (650) 787-6475, or toll-free in the continental US at (866) 378-5470.